Morgan’s grandpa always told Morgan that one day the Earth would rebel against Man for taking a big dump all over the land. Nature would surely exact its revenge against humanity because this was the 1970s and “nature run amok” movies about hoards of rabbits (Night of the Lepus), plagues of frogs (Frogs) and outbreaks of William Shatner (Kingdom of the Spiders) were all the rage. You know what Morgan’s crazy old grandpappy forgot when terrorizing Morgan with his left wing hippie eco-terror tales? That Nature may be pissed, but none of that matters when the giant rats, wasps and chickens attack a professional football player! Who gives a crap about a rat the size of a Volkswagen when you’re facing off against a psychotic 350 pound lineman every Sunday? Director Bert I. Gordon, an experienced hand at giant animal movies (Empire of the Ants, Earth vs. The Spider), tries to level the playing field on behalf of the roided up rodents by having his football player be a wide receiver and played by Marjoe Gortner. 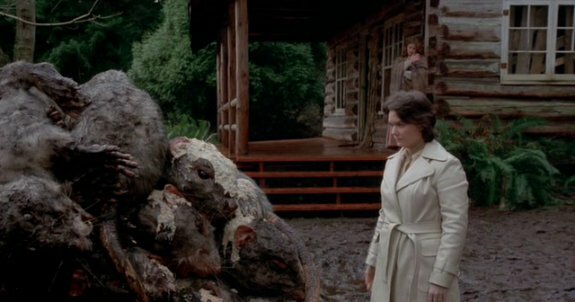 While Marjoe isn’t the first guy who comes to mind when you think about a football player fending off oversized animals in the woods, he does go instantly into homemade bomb mode and wages a nonstop guerrilla war against the creatures, the only emotion on display throughout, an irritated and slightly grossed out frown. It all begins innocently enough (except for Marjoe’s ominous voiceover about his grandpa that begins the film) when Morgan, a teammate, and Brian, the team’s public relations guy decide to relax before the big game by taking a trip into the woods. To its credit the movie is shot on location and features beautiful British Columbia locations. Unfortunately, it isn’t just nature that runs amok there, but also a bunch of scenes of people riding a ferry back and forth to the island. Since the rats are ultimately defeated because they suddenly couldn’t figure out how to swim, it feels like a missed opportunity that we didn’t see Morgan chucking rat carcasses off the ferry while a crusty old sea captain cursed about piles of football-sized mouse droppings dirtying up his deck! 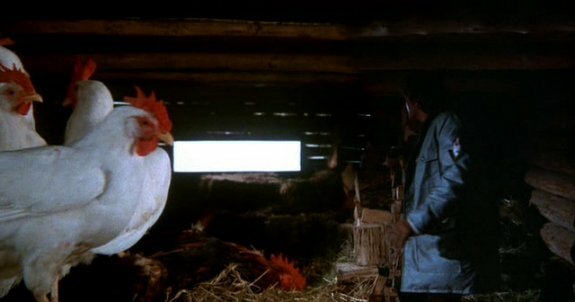 After Morgan’s and Brian’s buddy gets stung to death by gigantic wasps, Morgan goes in search of help and runs smack dab into a cabin with a barn full of gigantic chickens! And just what is the terrifying secret of the Food of the Gods? It’s just some icky slop bubbling up out of the ground on their property that when ingested causes young animals to get super-sized. Of course the crud is so nasty, nothing will eat it unless it’s mixed with regular animal chow. How or why Ma and Pa Kettle (as the jerk businessman played by Ralph Meeker so aptly called them) ever thought to mix all that stuff together and feed their farm animals is never explained. But then Ma goes and gets her arm all chewed up by foot long meal worms and suddenly scientific explanations and common sense seem utterly irrelevant in the face of such gross awesomeness! Morgan and Brian actually leave the island and come back later to further investigate, prompting Brian to question for the first time just how smart some of Morgan’s decision making is. Brian would again question Morgan back on the island whenever Morgan would drag him along on some harebrained scheme to fight off the army of giant rats and also when Morgan dissuaded everyone from making a run for it early on. Brian is ultimately proven right that Morgan’s choices were suspect, but it was a hollow sort of victory since Brian proved his point by getting devoured by rats while on one of Morgan’s rat fighting missions. The movie settles into a nonstop lethal combination of special effects involving unconvincing swarms of rats superimposed over scenery and large stuffed rat heads thrust at the characters in close ups. Countless scenes of normal rats apparently being shot or injured for real add that unfortunate touch of animal cruelty that pervaded such films during the 1970s before we became enlightened and gave rat performers the same rights as human actors so that only their careers would be hurt by appearing in such films. By the time Morgan blows up a dam to drown the rats, he’s been wearing them out for so long, you actually start to feel like Morgan is a bit of a bully. Food of the Gods isn’t very good. 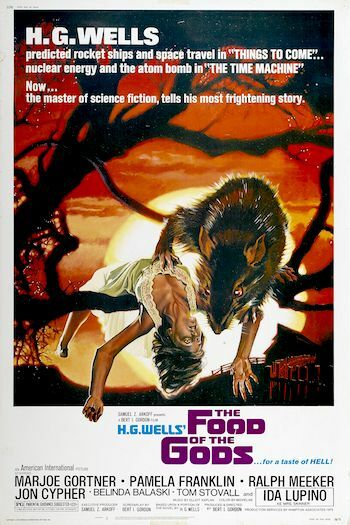 After all, it’s Marjoe Gortner as a football player fighting giant rats in a story based on a “portion” of an H.G. Wells novel. Just diagram everything wrong with that sentence. Other characters mill around him for the sole purpose of being rat fodder. 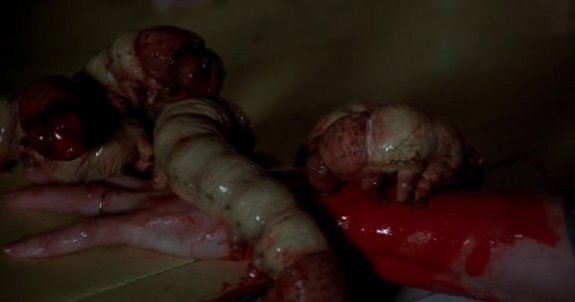 Was there really any reason for the couple with the pregnant woman to be on the island when she’s due any day except to provide the drama of giving birth while rats are trying to break into the house? And Ralph Meeker’s businessman is almost comically one dimensional in his callousness towards everything except packing his car full of the magic soup. And did the lady bacteriologist really tell Morgan she wanted to screw him while they were under siege from the rats?